What most would consider a disappointing season in the NFC East resulted in one fan base hoisting the Lombardi Trophy as the Philadelphia Eagles walked away Super Bowl champions. But the question remains; will the Eagles be able to defend their crown on the Road to Super Bowl 53 in a division full of new obstacles and talent? The defending Super Bowl champions, fresh off an exciting 41-33 victory in Super Bowl LII against the New England Patriots, the Eagles themselves will be returning the majority of their Super Bowl champion roster, including a look at a hopefully healthy quarterback Carson Wentz. Although the Eagles were susceptible to change in the 2018 offseason, losing key players like running back LeGarrette Blound, wide receiver Torrey Smith, defensive pass rusher Vinny Curry and tight end Brent Celek, the team did manage to bolster their already stellar defensive front, adding Seahawks Pro Bowl defensive end Michael Bennett, defensive tackle Haloti Ngata, and some young weapons through the draft. In what was considered yet another disappointing season for the Cowboys faithful, the team shook things up in the offseason hoping to turn it around in 2018. Despite retaining head coach Jason Garrett, the Cowboys are not without roster turnover in the 2018 offseason. The team lost two of its premier pass catchers in wide receiver Dez Bryant (released) and tight end Jason Witten (retirement), as well as two defensive staples in linebacker Anthony Hitchens and Orlando Scandrick. The Cowboys did, however, manage to bring in some big names, most notably former Rams wide receiver Tavon Austin, defensive end Kony Ealy and the former Jaguars standout receiver Allen Hurns. The Cowboys will also look forward to the return of a full season for running back Ezekiel Elliott, who was absent due to suspension for part of the 2017 season. Plenty of shakeup coming in the nation’s capital this offseason was headlined by the Washington Redskins deciding to move on from quarterback Kirk Cousins in favor of a former NFL MVP to take charge of the offense. Shortly before losing quarterback Kirk Cousins to the Minnesota Vikings, the Redskins traded cornerback Kendall Fuller and a third-round pick in the 2018 NFL Draft to the Kansas City chiefs for the Pro Bowl quarterback Alex Smith. After making the decision to hand the reigns to Smith, the Redskins continued their transformation, bringing in plenty of defensive talent and a talented young offensive core, most notably rookie running back Derrius Guice from LSU, linebacker Pernell McPhee and defensive back Orlando Scandrick. 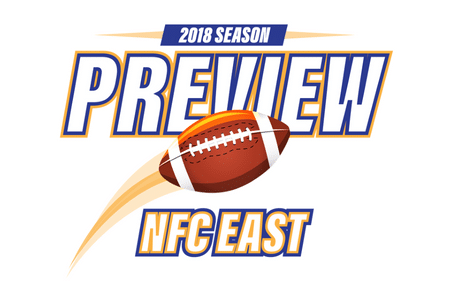 For New York Giants fans, the excitement of putting the last 12 months behind them with a fresh start at kickoff of the 2018 season will be a welcoming feeling. A 3-13 campaign, headlined by turmoil with former head coach Ben McAdoo, and an injury to Pro Bowl receiver Odell Beckham Jr., resulting in the #2 overall pick in the 2018 NFL Draft, leaves the Giants with a clean slate on the Road to Super Bowl 53. Despite losing key players such as defensive lineman Jason Pierre-Paul and wide receiver Brandon Marshall, the Giants reloaded on both sides of the ball, drafting possibly the most exciting player in the 2018 NFL Draft in running back Saquon Barkley out of Penn State, signing former New England Patriots offensive lineman Nate Solder and trading for former Los Angeles Rams linebacker Alec Ogletree. Looking to secure your travel package to Super Bowl 53 in Atlanta? Click here to check out all of our travel packages, including luxurious hotels, game tickets and the pre-game Players Tailgate.